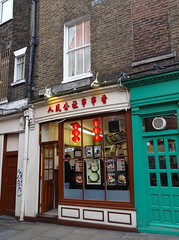 Tiny takeaway in Chinatown, next door to (and run by) Baozi Inn. The menu is restricted to hotpot-style skewers photo of menu as of July 2016, a couple of types of large filled steamed buns (baozi/包子) photo of menu as of September 2012, and a few of the dishes served at Baozi Inn. There's no eat-in space, and indeed the space is so small that they ask you to wait outside for your food; though the cooking time is only a couple of minutes, so this isn't too great a hardship. As of July 2016, there's a minimum order of three skewers. All skewers are cooked in the same numbing-spicy (ma la/麻辣) stock, so even the vegetable options are not suitable for vegetarians, unless you're OK with having your veg/tofu skewers cooked in the same stock as the meat options. In September 2012, Kake tried a fishball skewer and a Chinese leaf skewer (£1 each) photo. The former held just one and a half fishballs, sliced in half to let the stock penetrate (and make the portion look less meagre), while the latter went into the pot as one huge leaf that was snipped up with scissors after cooking. An optional sprinkle of fresh coriander finished it off. The stock was certainly both spicy and numbing; the Chinese leaf retained these flavours more vehemently than the fishball, to the point where I struggled to finish it (but in a good way, as lovers of chilli will recognise). In June 2015, Kake discovered that prices had gone up to £1.30 per skewer or £5 for five. The prawn ball skewer was very similar to the abovementioned fishball skewer, pretty tasty and not overly spicy. I liked the fact that it was served with minimal packaging; just the wooden skewer itself and a paper napkin. Accessibility: A step to get in, nowhere to sit, and very restricted space inside. Last visited by Kake, June 2015. Last edited 2018-11-15 21:51:34 (version 9; diff). List all versions. Page last edited 2018-11-15 21:51:34 (version 9).